Apple will reportedly turn to Intel's new XMM 7360 LTE modem when it launches a special next-generation iPhone model in 2016, suggesting the company is looking to diversify baseband chip suppliers. Intel's fast wireless modem, which debuted earlier this month at Mobile World Congress, will be used in an upcoming iPhone variant targeted for release in emerging markets like Asia and Latin America, reports VentureBeat. The report claims Apple engineers have been traveling "for months" to Intel's LTE chip research and development offices in Munich, Germany to work on the project. Intel acquired the facility when it purchased Infineon for $1.4 billion in 2010. Apple tapped Infineon to provide chipsets for the original iPhone introduced in 2007, and continued to source silicon from the firm until it was bought out by Intel. Apple has since relied on wireless chips from Qualcomm, but the publication's sources said Apple has an "uneasy" relationship with the company. Although Intel is a major supplier for Apple's Mac range of products, it passed on the opportunity to get in on iPhone at the ground floor. Tension between the two companies mounted as the chipmaker continued to push its Atom processors in products competing against iPhone and iPad, which are powered by Apple's ARM-based A-series silicon. 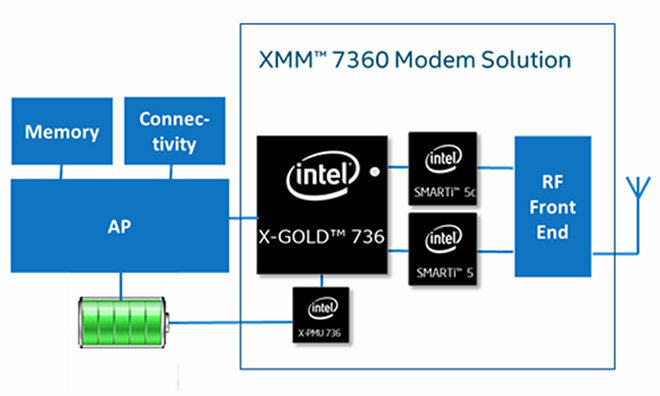 In a brief detailing the XMM 7360, Intel notes key features include LTE-FDD/TDD up to 450 Mbps, LTE Advanced up to Category 10, Voice over LTE, 3X carrier aggregation and the usual smattering of worldwide band support. Notably, the chip is compatible with TD-SCDMA, a unique wireless standard used by China Mobile.